This entry was posted in Faith, Taiwan, Travel and tagged Alishan, CingJing, Hualien, Taiwan. Bookmark the permalink. Hey . your blog is awesome ! i like the way you write down steps by steps .. it helps a lot 🙂 thanks ! i wanted to ask ..
5 of you right ? is it cheaper to travel by 2 taxis or van ? Yup, 5 of us…. I think it is best (more comfortable and economical) to take a 7-seater cab… you can contact Orange Lai (H/p No. : +886-932-348-424 Email Add. : clip1688@hotmail.com) for details regarding the charges. i see .. let’s say i have 5 too . so everytime i have to travel by 2 taxis ? how about those minsu’s driver ? thanks ! OrangLai is for HuaLien one ? It’s not convenient to travel in 2 taxis (and it’s more expensive as well). We only took 2 taxis once when we were in Taipei. 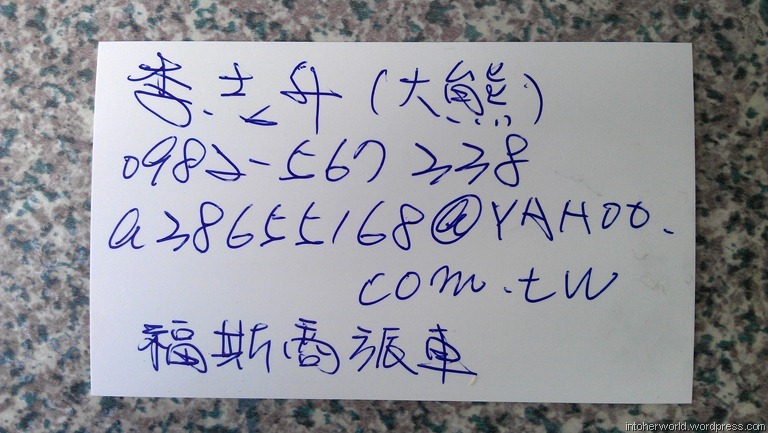 If you need a cab when you are in Hualien, you can call this number: 08-00046046 (花蓮統一計程車/Hualien Tong Yi Taxi). Just inform the operator that there are 5 of you and they will send a 7-seater Toyota Wish. If you are planning to charter a car for a one-day tour of Taroko Gorge, you can either hire Orange or Tiffany. Tiffany at +886912522118 or tiffany_935lk@yahoo.com.tw. Alternatively, you can visit her Facebook page http://www.facebook.com/Tiffanytaxi. This is a very inspiring posting. I am always sincerely impressed when reading your offerings. You post interesting info. Keep it up. Keep blogging. looking forward with great anticipation to going over your next posting. Hi, i would like to ask you if where would be better for two night and 1 night stay in taiwan. alishan? cing jing? or sun moon lake? pls reply me via the email. thanks. Useful information. Can I asked the following questions? The driver mentioned above – is there any that speak English? All trip start from Hualien. Is there any driver that do the other way round – Sun Moon Lake, CingJing to Hualien? 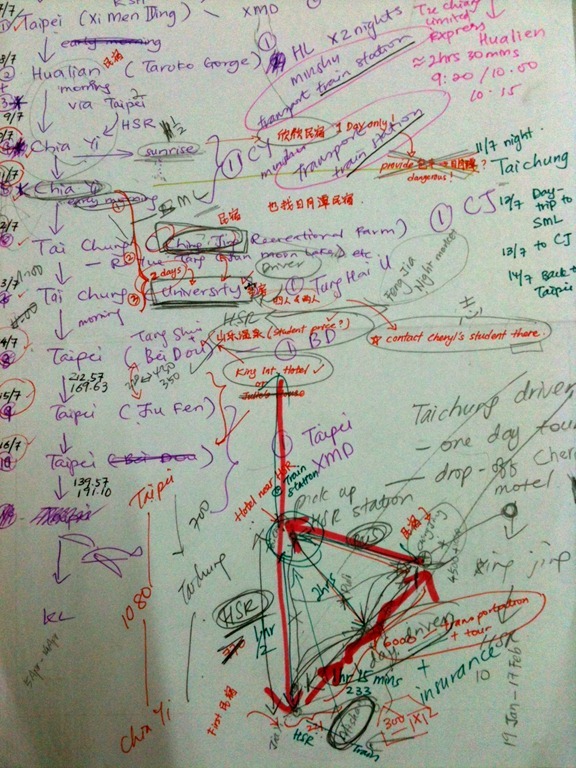 I am planning a Taichung-SML-Taichung-Cingjing-Taichung-Chiayi-Alishan tour. Doing a day trip to SML from Taichung and staying 1 night at Cingjing before going to Alishan early next morning. Hey Kendrick, are you travelling alone? Or with family/friends? If you’re travelling with a group, I’d recommend that you charter a taxi instead… That way you can save money and cut down on travelling time. All the three points (Alishan, Sun-Moon-Lake and CingJing) are connected by road. I will be going to Taiwan in early August this year. Taoyuan > Alishan > Taichung > Cingjing > Hualien. Do you know if the forest railway to Alishan is still open? May I have the contacts of the driver that you engaged? 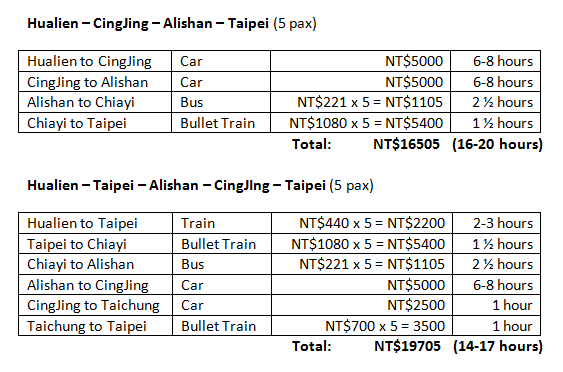 For your trip, did you engage the driver from Chiayi HSR up to Alishan? – engage a driver from Cingjing to Taichung ??? stay for 2 nights (do u think it is better or proceed to somewhere else? – from Taichung take the THSR to Taipei and stay for 4 night. That’s feasible but we didn’t travel from Taroko straight to CingJing. Instead, we took the train back to Taipei, stayed one night and then took the HSR down south the next morning. We had to spend time and $$ in order to avoid unforeseen circumstances, such as bad weather and landslide, which may lead to road closure. You might want to do more research on road condition/safety for travel from Hualien to CingJing before you decide. I had planned to book a driver for the journey from Taichung to Hualien. I am considering after reading your post. Thank God I come across your blog. Am going to taiwan this june. End of june. I also want to visit alishan cingjing hualien n yilan if possible. I read from another blog that the road from cingjing to hualien was blocked due to rain n rocks on highway. So the driver suggested to drive to yilan then hualien which was very long journey n missed out a few attractions. I have 11 to 12 days and I thought I can explore your itinerary! I’m going with my hubby n 2yo boy so safety and not so long journey is our priority. Thank u n God bless! Phews, I am glad to find your blog as my boyfriend and I have been searching the discovering trips since last week. Well, we are going to Taipei next month in April and we have not yet booked the hotels/villas in northern of Taiwan except Taipei. So, we are going there for probably 6 days as your previous itineraries are almost the same as me. our main concern is to visit the geographical values and natural things. We love photography as well. We don’t fancy shopping or souvenirs things except the break time only. Eileen- Please advise me for your suggestion and also provide me the transportation (bus and train), Alishan schedule time bus and go on. Hi Cheryl! I’ve struggling to come up with an itinerary. I went to Taipei and went to Sun Moon Lake, Jiufen , Shifen and the area around. Hoping to now go to Taroko Gorge/ Hualien, CingJing and maybe Yilan for about 5-7D. Can you help suggest an itinerary or email me? Btw, when you hired the driver/ tour guide for Taroko Gorge, was there a lot of walking to do? I’ll be travelling with my parents and two young kids. Hi Lyn, we did walk a bit when we were touring Taroko Gorge. You can discuss with your driver though… if it’s too taxing for your parents and kids, you can leave out the trails etc… btw, what’s your email address? I can fwd my itinerary to you if you like. Is the Taroko Park tour a round trip ie back to Hualien so that we can get our luggage to go back to Taipei? How do you purchase the train tickets to Hualien? (2) Is the Taroko Park tour a round trip ie back to Hualien so that we can get our luggage to go back to Taipei? (3) How do you purchase the train tickets to Hualien? I purchased the tickets online…. and then collected the tickets at the Taipei Train Station. Hope that helps. Enjoy your Trip to Taiwan. My family and I (total 5 adults) are planning to go to Taiwan for 6D5N next month. We are planning to go to Yilan, Hualien and Cingjing. However our driver suggests to drive from Taipei down to Taichung on Day 1 and move to Cingjing, Hualien then last to Yilan instead. What do you think about this direction instead? Could you share with me your itinerary as well? Thanks! I’m so sorry for the late reply. I’ve forwarded the itinerary to your inbox. Can you also share your itineraries with me?